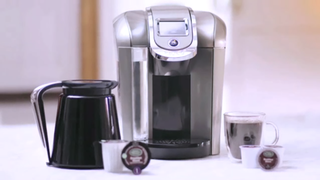 When Keurig announced its new Keurig 2.0, it came with more than just the ability to brew larger 30oz K-Carafe cups. It also came with measures to ensure only Keurig-approved cups could be used. Those measures didn't work. The new security precaution involved the use of some sort of specialized ink marking present on top of official K-cups, the lack of which would cause the Keurig 2.0 to stop doing its insta-coffee magic and just display "Oops" on the screen. It was a sensible if not at all consumer-friendly stop-gap against cheaper "knock-off" K-cups, but one that non-Keurig-approved K-cup maker Treehouse Foods said it could defeat in a few months. It didn't take that long. Just a few days before the Keurig 2.0's actual release, competitor Mother Parkers Tea & Coffee put out a press release announcing its cups would work with the new machine, vaguely alluding to the DRM by mentioning how its new cups offer not only coffee but "freedom of choice." It's possible the pair reached an agreement, but it sure sounds like these guys just cracked the code.